Figure 1 below shows the measured Color Gamuts for the LG 2017 OLED TV Picture Modes along with the Standard DCI-P3 Color Gamut in Yellow and the Standard sRGB / Rec.709 Color Gamut in Black. The outermost white curve is the limits of human color vision - the horseshoe is the pure spectral colors and the diagonal is the Line of Purples. A given display can only reproduce the colors that lie inside of the triangle formed by its primary colors. The dots in the center are the measured color of White for each of the Picture Modes along with the D65 Standard White, which is marked as a white circle. To deliver accurate image colors the display must match both the Standard Color Gamut and the Standard Color of White. The Cinema Wide and HDR Picture Modes are an accurate match to the DCI-P3 Standard Color Gamut that is used to produce the new 4K UHD TV content. 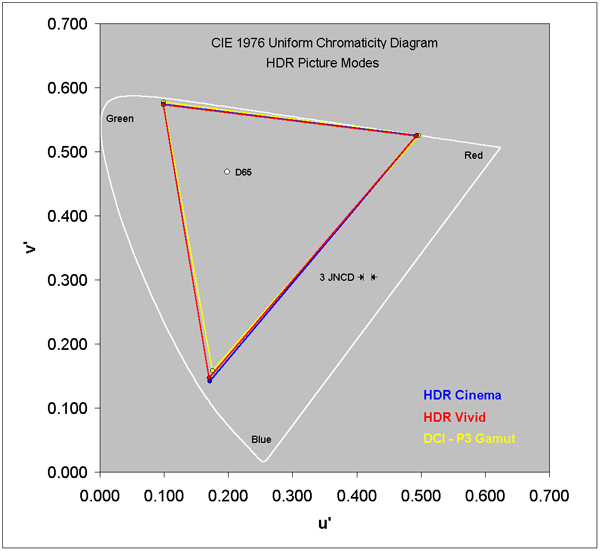 The Cinema Normal Picture Mode is an accurate match to the sRGB / Rec.709 Standard Color Gamut that is used to produce all current 2K Full HD TV content. 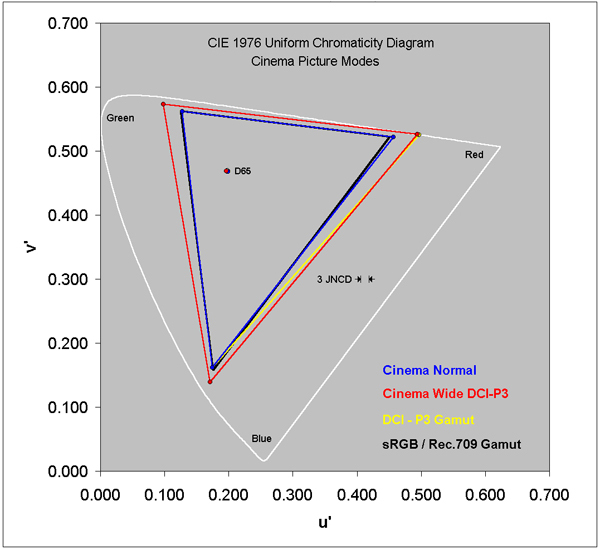 See this Figure for the Absolute Color Accuracy measurements for the Cinema Picture Modes.